Well, it’s finally peach season here in Michigan. Whoo-hoo! When I went to Farmer’s Market on Sunday I could smell peaches everywhere. 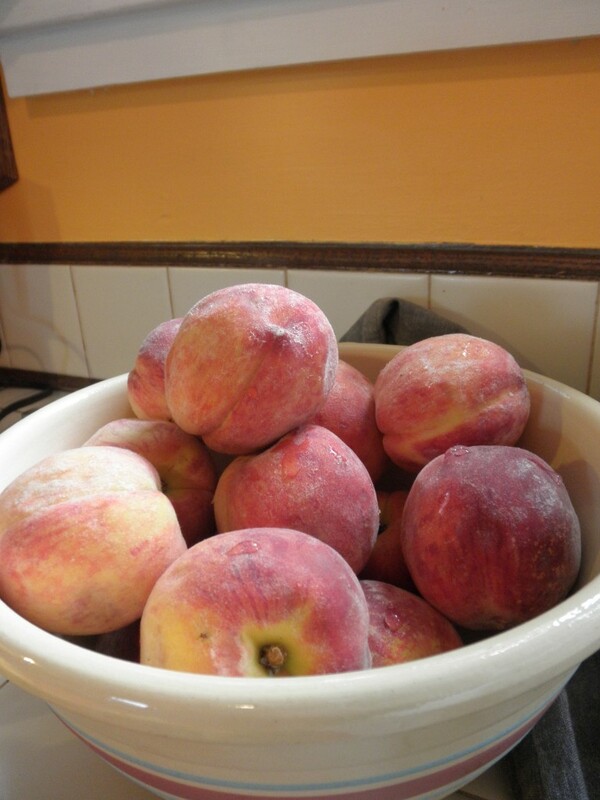 They were luscious and sweet, and I couldn’t resist buying a bunch for peach jam. Peach jam is a summertime favorite, and it’s a great way to take advantage of sweet, cheap peaches. I made up this batch yesterday, and I couldn’t believe how easy it was. First, I didn’t know there was a crafty way of removing peach skins (I removed all mine by hand…). I only found this out by sheer accident, last night, as I was reading through my Ball Complete Book of Home Preserving dreaming of my next canning adventure. I’m a bit miffed Ball didn’t put this handy tip by the recipe itself. Know where I found it? In the very back of the book. Is this common knowledge that I just totally missed out on? I don’t know. Anyway, I spent a great deal of time peeling peach skins with a paring knife yesterday. I got really good at it. If you want to skip becoming an expert peach skin peeler, boil a pot of water and dunk your peaches in there for 30-60 seconds. Run them under cold water immediately. Apparently, the word on the street is that they’ll come right off. The recipe I’m about to share calls for 4 cups of finely diced peaches. I had small to medium sized peaches. I found that it took around 3 peaches to make 1 cup. So, I used 12 peaches for this recipe. 2. 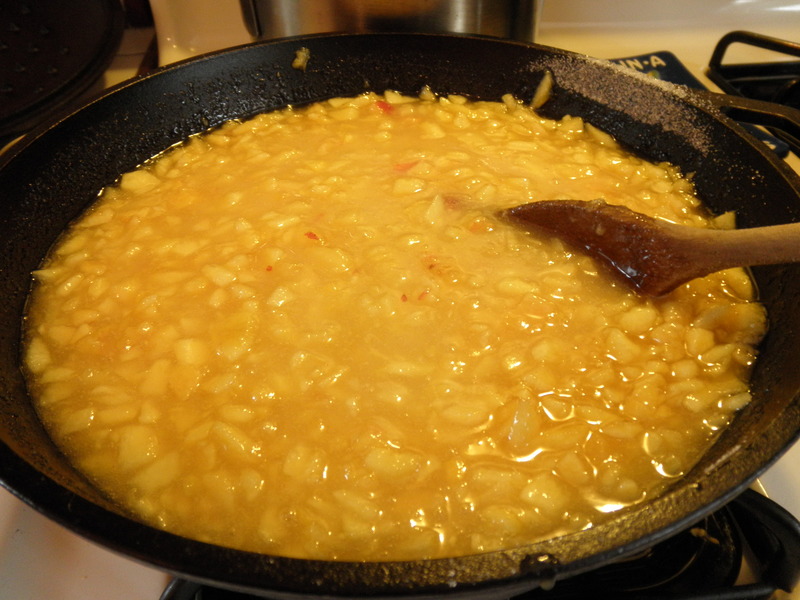 In a large stainless steel saucepan, combine peaches, lemon juice and sugar. Over high heat, stirring constantly, bring to a full rolling boil that cannot be stirred down. Stir in pectin. Boil hard, stirring constantly, for 1 minute. Remove from heat and skim off foam. 3. Ladle hot jam into hot jars, leaving 1/4 in. headspace. Remove air bubbles and adjust headspace, if needed, with more jam. Wide rim. Center lid and screw band down until fingertip tight. 3. Place jars in canner, ensuring they’re completely covered, and bring to full boil. Process for 10 minutes. Remove lid, wait 5 minutes, then remove jars, cool and store. Ok, so obviously the peach jam is gorgeous. But, I did do a few things wrong (I found out this morning, when I ate it on my English Muffin). So, this is another incredibly important tip that Ball has at the back of the book. Which, I also read last night. 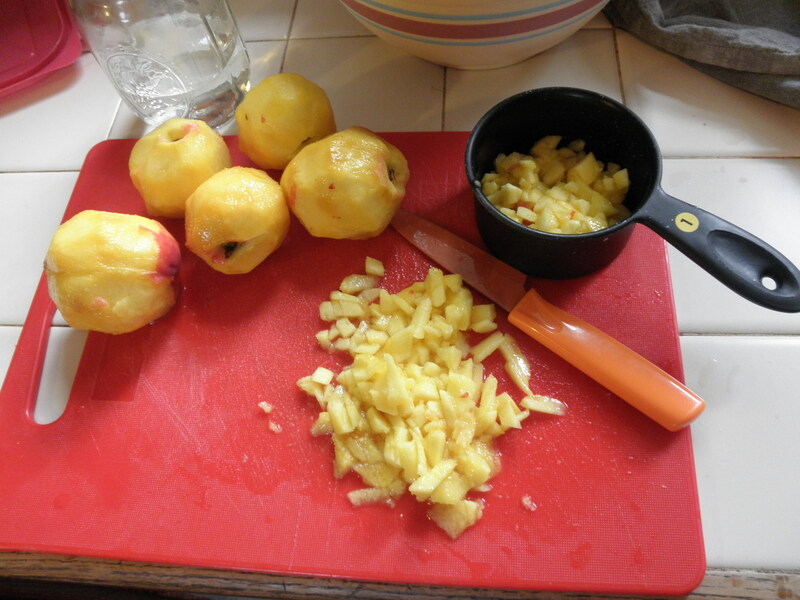 After I’d made my peach jam. Every recipe always says to use a stainless steel pot. But I didn’t think it was a big deal that I was using cast iron. After all, my Dutch Oven is the only pot I have big enough to make jam in, and I didn’t see the need to go out and buy a stainless steel pot if I didn’t need to. Well, the cast iron hasn’t been a big deal until the peach jam. Apparently, the acidity in the peaches reacts with the iron, causing it to taste…off. It’s a bit metallic tasting. It tastes great when you pair it with something, like ice cream or cream cheese (yum!). But on its own, you can definitely taste the slight tinny-ness of the reaction. So, USE STAINLESS STEEL FOR THIS RECIPE. Yes, I now have to go buy a stainless steel pot. 2. This Recipe Foams. A lot. My peaches almost boiled over my pot because once they start boiling, they fluff up. I made the mistake of hurrying up the cooking time (when it says “boil hard for one minute) because I was about to make a huge, sticky mess. Because I didn’t boil hard for exactly one minute, my peach jam is runnier than it should be. I didn’t realize how important and iron-clad that one minute is, but I looked it up and yes, it’s really important. Don’t turn off your stove at 30 seconds, or even 55 seconds. When they say 1 minute, they mean 1 minute. Now, the jam isn’t like soup or anything. It’s just not quite as firm as my strawberry jam. So, use a large pot for this recipe so you don’t rush and get runny jam. Other than the two mistakes I made, the jam really is good. It just didn’t turn out as good as it could be because of the pot, and my rushing the cook time. How about you guys? Are you making peach jam this summer? Have any tips or funny mistakes you’d like to share? If so, I’d love to hear them! Looks delish! 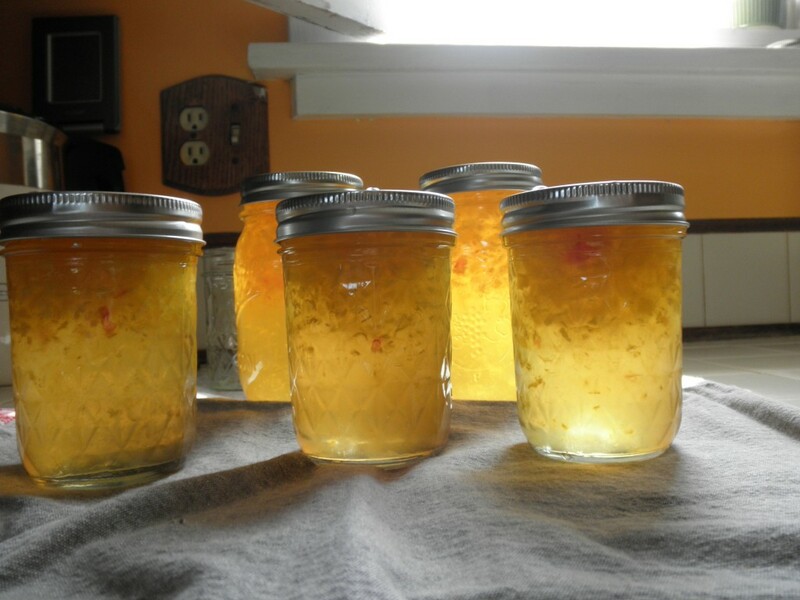 Now to toast the English Muffins..
I’ve been canning for decades – jams, jellies, pickles, anything 🙂 You don’t necessarily need a stainless steel pot, just one that’s NOT cast iron. Look in your local thrift store for any big old enamelled pot, or one of those big old blue-and-white speckled ones. Here’s another tip. Notice how the fruit has risen to the top and all the liquid is at the bottom in your photo? After the jars are sealed and are still hot, flip them tops-side down and let them continue to cool. Check them about every 30 minutes and when they’re still very warm and the fruit is inside the liquid, flip them again. If you don’t take these steps, the fruit pieces float to the surface leaving only the jelly in the bottom of the jar. This tip is from “Yes, You Can!”…a terrific step-by-step guide to preserving food by Daniel Gasteiger. Jan, thanks so much for that great tip! I’ve noticed several other of my jams do that as well (especially my Habanero Gold!). I’ll definitely start flipping them after they’ve sealed. Yay! Thank you!